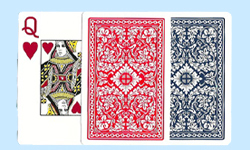 Royal 100% Plastic Playing Cards, one of the oldest brands of plastic decks on the market today, are a great value. 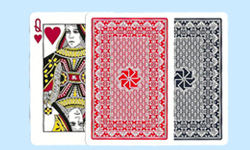 Plastic Royal Playing Cards feature stylish back designs with geometric patterns. 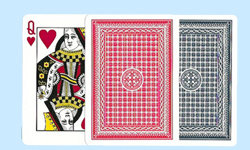 Royal 100% Plastic Playing Cards are available in wide or narrow Red/Blue two-deck sets, with regular or super index numbers and pips. Narrow, super index decks come in two-deck plastic boxes, and the narrow regular index decks and poker decks come in single plastic boxes (note: all styles are sold in unit of two decks). For more information or volume pricing on Royal Plastic Decks, please contact us at 1-800-233-0828.